Last updated 20 September 2018 . By Faith Strickland. It’s been three years since I moved to London, holed up in a tiny Islington flat and trudging the five miles to work to try and scrape enough pennies to spend at the pub every weekend. Upper Street used to be my escape - a bit like browsing in Waitrose while shopping on an Aldi budget. Several years on, the stretch is still awash with expensive homeware shops, but it’s also in the middle of a restaurant boom, with several big names setting up, including the second venue of BabaBoom. I returned to my old stomping ground, only this time to dine in rather than gaze hungrily on. Mashing cafe with casual restaurant, BabaBoom is catching both the brunch and the date-night crowds. 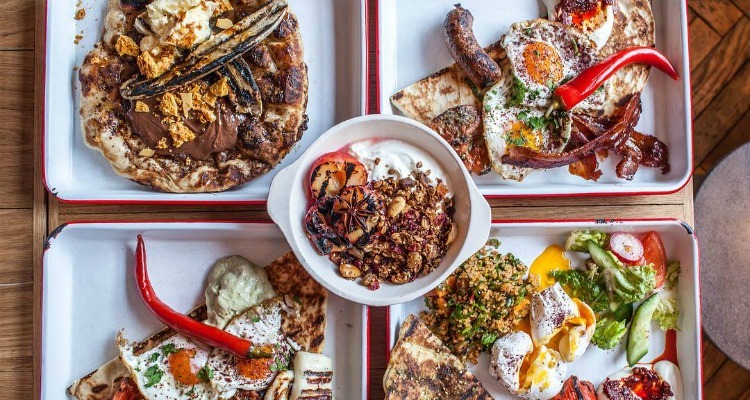 Having conquered Battersea with their brand of affordable Middle Eastern dining and frozen margaritas, BabaBoom’s team are sticking to pretty much the same formula for their North London spot. Interiors are the sort of all-day mash that sees you pitching up for a boozy date and returning less than 12 hours later to discuss details over a big brunch plate. It's a long stretch of space, with foldable windows at the front, blue and white patterned tiles, and cutesy candy pink booths at the back. It may have only been open a couple of weeks but the spot is already crammed with couples and groups, piling into the back booths or looking out over Upper Street. The restaurant is the work of three friends - two ultra runners and a skier - a fact that is reflected in a menu of big, hearty and largely wholesome dishes. It’s mainly British produce given a Middle Eastern twang; meats are smokey from a charcoal grill and there's a subtle fruitiness underscoring plates. The sweet potato hummus starter (£5.25) was a less nutty version of the classic, with crispy fried onions adding to the sweetness of the plate. We tore through the candied skin of sticky summac wings (£5.75), chomping on meat that tanged from a squeeze of fresh lime. British ingredients are used to make Middle Eastern classics. Kebabs are no longer the staple of a rowdy night out but rather a proper sit-down meal, and here they're served in thick, tearable flatbread on red and white trays. The lamb and sour cherry adana (£11.25) sat atop a bed of undressed, light slaw, with richer roast peppers and a whole chargrilled chilli - adding a slight heat to the dish when cut up, forcing you to down an entire frozen margarita when eaten whole. Not that that’s a bad thing; two old-school slushy machines decorate the geometric patterned bar, swirling bergamot and passionfruit margaritas, a dangerous drink that can only be a precursor to a great night out. 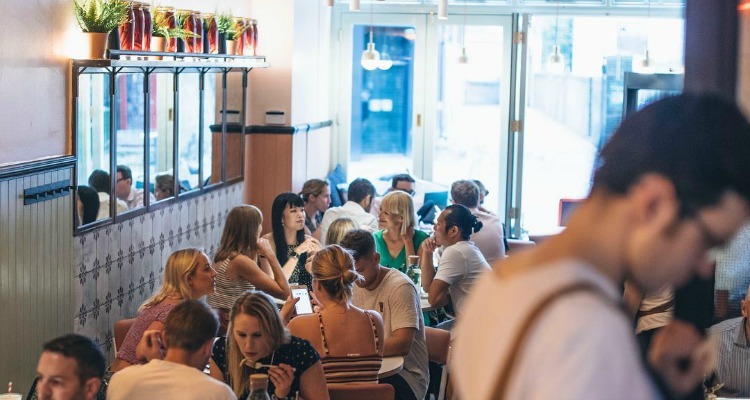 Upper Street is still a happy mix of restaurants, from cheap and cheerful Desparados through to James Cochran's new home. BabaBoom sits in the middle, a spot that will grab the date-nighters but also call in brunchers. It also errs on the side of affordable, meaning even window shoppers like me can go and enjoy dinner on this North London stretch.